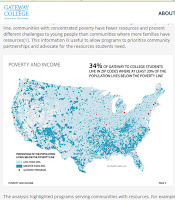 Just found this Gateway To College map. I'll reach out with an introduction. Hopefully some of the ideas I share here and on the Tutor/Mentor Blog will be used in their own efforts. This just came across my Twitter feed. Open the link and you'll find a map of the USA, with the 2010 census data plotted, and color coded for different racial groups. It clearly shows how big cities around the country have the greatest concentrations of minorities, and the greatest challenges of race and inequality issues. This report came across my Twitter feed today. It's titled: "Getting to Ground Truth: Integrating Social and Spatial Statistics to Support our Communities’ Most Vulnerable Children and Families" and is published by the Children’s Trust of South Carolina. 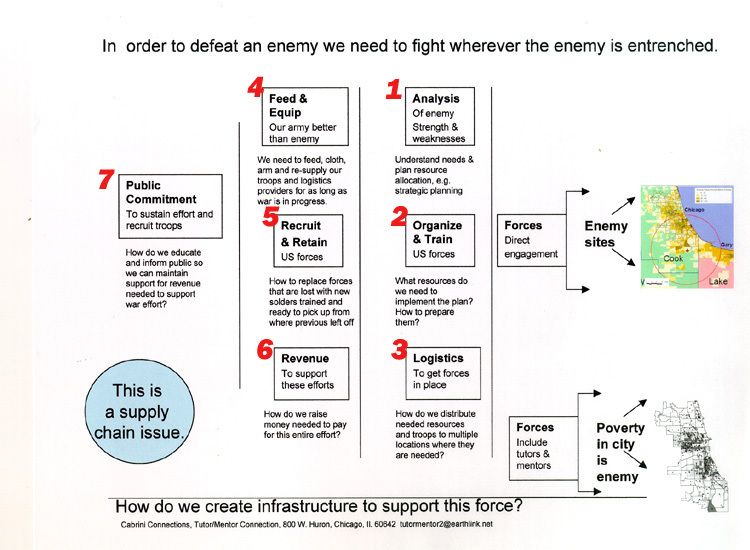 What I like about the report is that it serves as a guide that leaders in Chicago and other cities might also use. In many of my articles, like this one, I emphasize a use of maps to plan for a distribution of programs and resources into all high poverty areas of large urban areas. Poverty growing in cities. New report. My Twitter feed brought this article to my attention. It's titled "More People Living in High-Poverty Neighborhoods, Researcher Says" Open this link to find the full report, by by Paul Jargowsky, a fellow at the nonprofit Century Foundation. I share this with the goal that people who find this blog will forward the articles to people in their own networks, and will lead on-going discussions of the information, so more people become informed and involved in reducing poverty and inequality in the US and around the world. Visit this Urban Institute page and see a story about crime changes in Washington, DC from 2000 to 2014. Not sure if this is yet available in other cities. 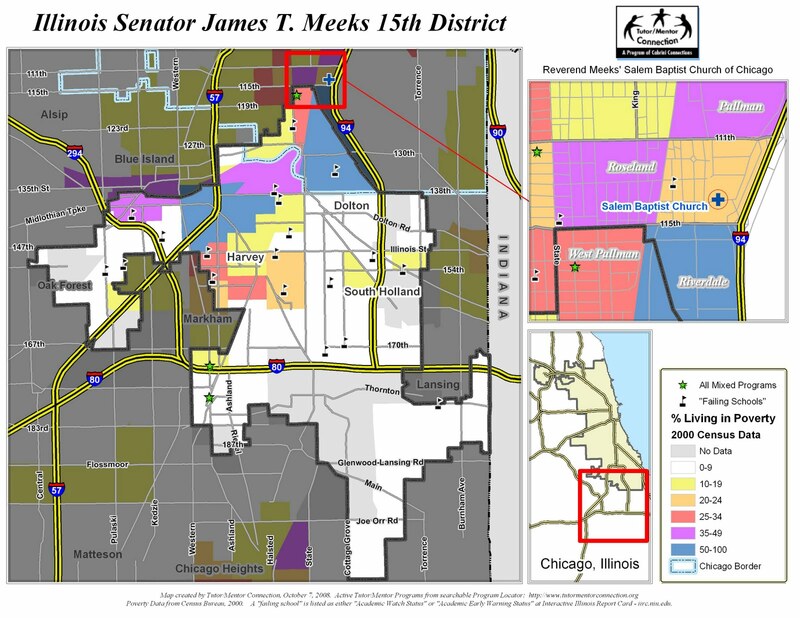 If you browse through past articles on this blog you'll see examples of how the Interactive Tutor/Mentor Program Locator has been used to create maps of community areas of Chicago where indicators such as poverty, poor schools, violence, etc show a need for more youth and family supports, such as organized volunteer-based tutor/mentor programs. Due to a lack of talent and resources since 2010, features of the Program Locator that allow you to zoom into zip code, community area and political district boundaries are not working. 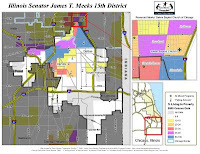 In addition demographics still represent the 2000 census and the tutor/mentor programs shown on the map no longer represent close to 100% of those organizations operating in the Chicago region. Thus, in many of my articles I point to other mapping and data platforms. One that I encourage you to browse and learn to use is the Community Commons portal. Visit this page and you can enter Chicago, Detroit or any other city, and see an interactive map showing poverty levels for that city. These maps also include info on political districts. Using this information many users can create map stories, like this one, that they share in blogs, web sites, presentations, etc. which are intended to build attention, and participation, in efforts that fill the map areas with programs that reduce the levels of poverty over a period of many years.